Get an overview of the organisms featured in the Rocky Intertidal Slide Show. View a list of the organisms in the show. Print out and read about life in the Rocky Intertidal Zone. Compare and contrast organisms, visit links to ToL pages for each organism, and view information at a slower pace. 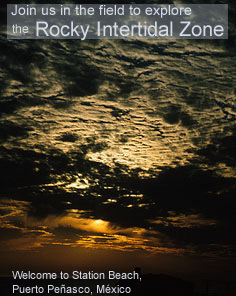 The rocky intertidal zone is the area of the sea floor between the high and low tides. This zone is unique to the marine environment because it is often exposed to air. Organisms that live in rocky intertidal zones have to find ways to adapt to changing temperatures, salinity, wave action and avoid drying out. Rocky intertidal zones are found all over the world. 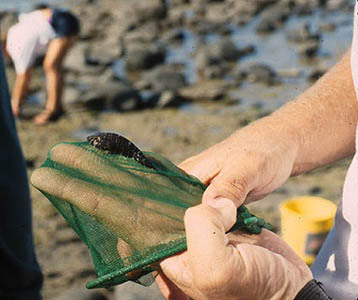 Each intertidal zone is unique and has a variety of different organisms and substrates in which organisms live. In the Gulf of California the ocean meets the desert. 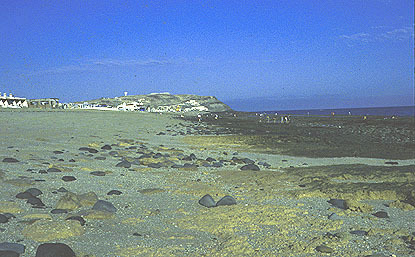 Intertidal organisms found in this region must deal with extreme tides, very little rain, and fluctuating temperatures. 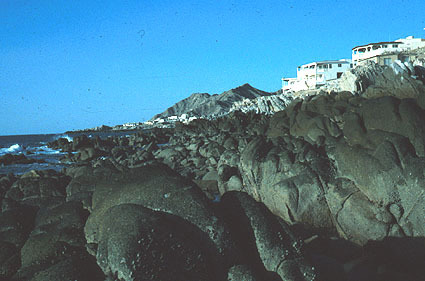 The rocky intertidal zone at Station Beach in Puerto Penasco, Mexico is divided into four zones. 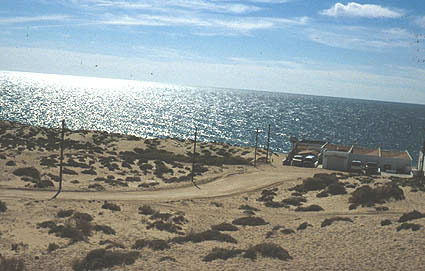 Zone one is the area of the beach that is almost always exposed to air. This is the area of the beach covered entirely by sand. Zone two refers to the area where there is sand and basalt boulders, which are smooth volcanic rocks, covering the sea floor. Zone two is covered by water part of each day. Zone three is the area where there is a little sand, basalt and coquina, a more porous rock made of compressed sand, is found. Zone three is covered by water most of the day. Finally, zone four refers to the area of the rocky intertidal zone found in Puerto Penasco that is mostly covered in water and composed of only coquina rock. The zones at Puerto Penasco often overlap and there is not a clear line that differentiates one zone from another. Therefore zones are often identified by looking for certain organisms common to that zone. There are four organisms found in the rocky intertidal zone in Puerto Penasco that are known as indicator species. These Indicator species are usually found within a certain zone. Therefore people use these species to determine what zone they are in. This is a beach pill bug (Tylos punctatus). 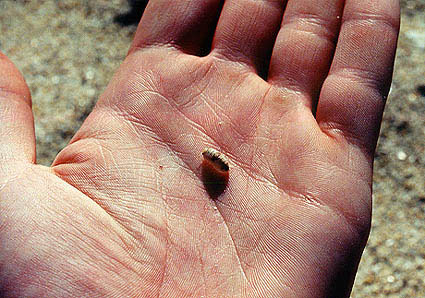 Pill bugs are found on the beach in Puerto Penasco and are an indicator species of zone one. Since zone one is often exposed to air the beach pill bugs have to avoid desiccation, or drying out. To find out more about pill bugs, go to the ToL Isopoda page (link also available from the linked groups menu in the right sidebar). Here we see the indicator species of zone two on a basalt rock. These small barnacles (Chthamalus anisopoma) are found living on the smooth surface of basalt rocks in zone two. Since basalt is a very hard substrate often times these small barnacles are the only organism that is able to bore into and attach onto the rock. Other organisms however use the undersides of the basalt rocks as shelters and places to feed. To find out more about barnacles, go to the ToL Cirripedia branch page (link also available from the linked groups menu in the right sidebar). *Note that this ToL page only has a phylogenetic tree available at the present time. These barnacles are a group of Thatch-roof barnacles (Tetraclita stalactifera). 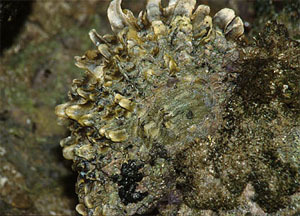 Thatch-roof barnacles are an indicator species of zone three. They attach themselves to coquina or basalt rocks in the area. 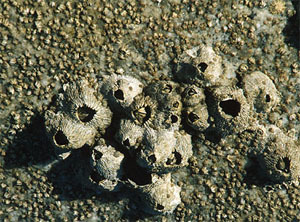 Since coquina rocks are porous and have many small crevices thatch-roof barnacles must compete with other organisms in the intertidal zone for space on the rocks. 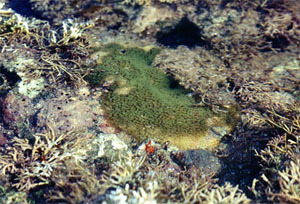 The donut shaped organisms shown here are brown carpet anemones (Palythoa ignota). 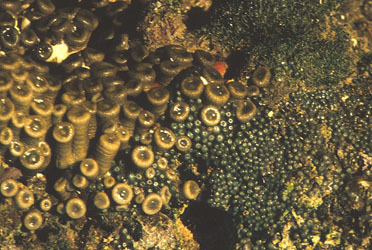 Brown carpet anemones are found attached to coquina rocks that are located in zone four. Anemones need to be submersed in water to feed so they are often restricted to living in zone four where water is abundant most of the time. Brown carpet anemones also depend on zooxanthellae, small unicellular algae, for nutrition. The algae live inside the cells of the anemone and provide it with sugars made through photosynthesis. In return the anemone gives the algae a place to live. Since both organisms are benefiting from this relationship it is known as a symbiotic relationship. To find out more about sea anemones, go to the ToL Actiniaria branch page (link also available from the linked groups menu in the right sidebar). Adult anemones such as these brown carpet anemones usually do not move. 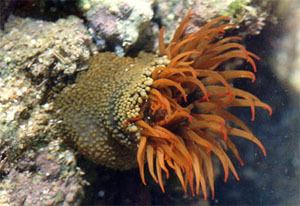 Although some anemones can move by gliding along a substrate generally sea anemones attach to a rock and remain there. Sea anemones, like this naked, warty anemone (Bunodosoma californica), have a ring of tentacles that surround the mouth. The tentacles have special cells called cnidocytes that contain stinging structures called nematocysts. These tentacles help the anemone capture and bring food to the mouth. Other important organisms associated with the rocky intertidal zone are algae. 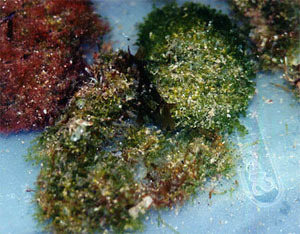 Algae, like these green turf algae (Cladophora sp. 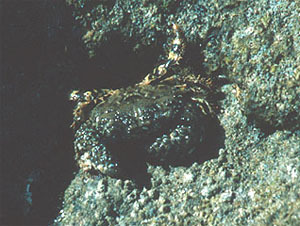 ), are an important part of the rocky intertidal ecosystem. Most green algae provide food and oxygen for other organisms by converting the energy of the sun into sugars and oxygen through a process know as photosynthesis. To find out more about green algae, go to the ToL Green Plants branch page (link also available from the linked groups menu in the right sidebar). The note page Algae: Protists with Chloroplasts provides some more interesting information. 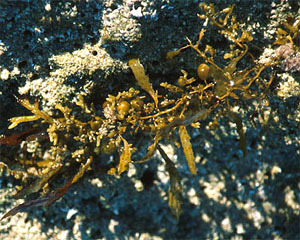 Brown algae like these zoned fan algae (Padina durvillaei) are also found in the rocky intertidal zone and are an important source of food and oxygen. To find out more about brown algae, go to the ToL Stramenopiles branch page (link also available from the linked groups menu in the right sidebar). The note page Algae: Protists with Chloroplasts provides some more interesting information. Sargassum is another species of brown algae found at the rocky intertidal zone in Puerto Penasco. Image copyright © Scott McKinney. Red algae, like the branched coralline algae seen above, are also abundant in the rocky intertidal zone. Coralline red algae are important in the marine environment because they can deposit calcium carbonate, which is important in the building of coral reefs. To find out more about red algae, go to the ToL Rodophyta branch page (link also available from the linked groups menu in the right sidebar). The note page Algae: Protists with Chloroplasts provides some more interesting information. Emerald corals (Porites californica) are related to sea anemones. They provide food as well as a place for organisms to attach and live. 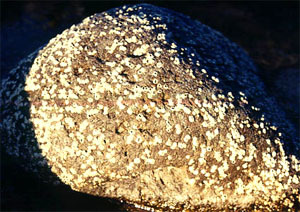 In the rocky intertidal zone they are often attached to the upper side of coquina rocks. Like the brown carpet anemones zooxanthellae are important in the nutrition of emerald coral and they form a symbiotic relationship. 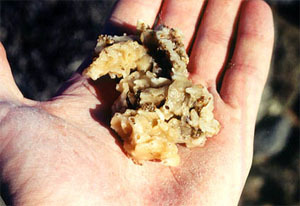 This breadcrumb sponge (Leucetta losangelensis) is often found attached to the underside of coquina rocks). Sponges are animals that lack tissues and organs. They are sessile organisms that do not move once they are attached to a substrate. 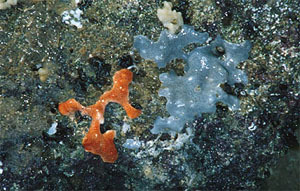 Sponges are found attached to the underside of coquina rocks in zone three and to the upper and undersides of the coquina rocks in zone four. Like the anemones they need to be submersed in water to feed. 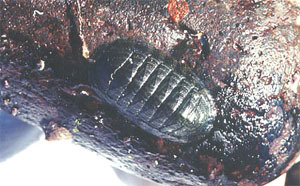 The breadcrumb sponge is the home of the isopod (Paracerceis sculpta) that also lives in the rocky intertidal zone. The sponge may also provide homes for other organisms small enough to fit inside its pores. These organisms are grey and orange colonies of tunicates (Didemnid sp). Tunicates are often confused with sponges however, they have a different texture than sponges and are not in the same phylum. Tunicates are more closely related to bony fish than they are sponges. 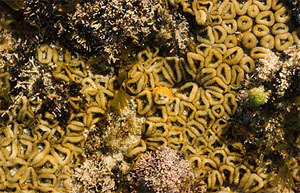 In addition to the barnacles, anemones, algae, coral, sponges and tunicates there are many other species of organisms found in the rocky intertidal area. 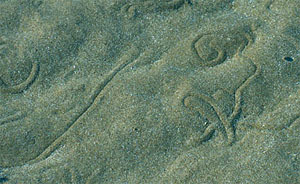 These are the tracks left in the sand by a small olive snail (Olivella dama). Snails, unlike the organisms mentioned above, are not sessile. Snails move around in search of food, space and to avoid desiccation. Like most snails this tower snail (Turritella sp.) has a hard shell protecting the soft body. Snails also have a foot, eyes, tentacles and a siphon. The tower snail is a detritivore that eats only dead organic material. 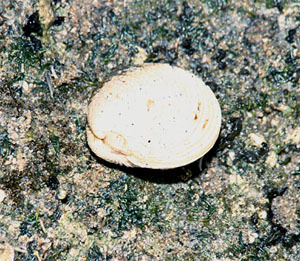 Snails can be found in all four zones but are often found in pools and moist areas. The large olive snail is a predator. They use their radula, which is an area of small teeth located in the mouth, to feed on other organisms. 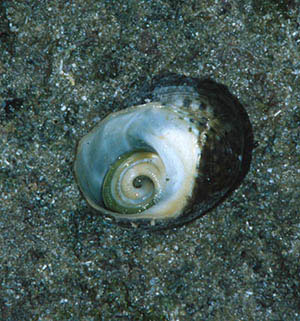 Some snails like this turbo snail (Turbo fluctuosus) avoid drying out by closing the shell with the operculum that is attached to their body. The operculum is a hard plate that closes the shell like a plug. The oyster (Ostrea sp.) is a bivalve that possesses a two-part shell. Inside the shell are the gills of animals that it uses to feed as well as to obtain food. Strong muscles line the mantle or body of the organism. These muscles open and close the shell. Oysters attach their shell to hard substances and are sessile. 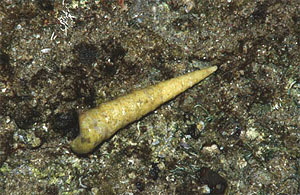 They can be found in the moist parts of the second, third and fourth zone of the rocky intertidal area. The clam is also a bivalve. They however are not sessile. They use their foot to bury themselves in sand. Clams are able to breath and eat while buried in the sand by using their siphon, a tube-like structure that brings water in and out of the shells cavity. 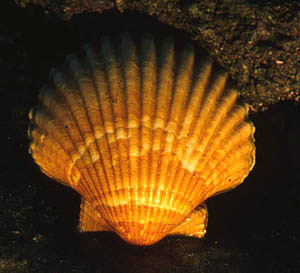 Scallops are another type of bivalve. Some scallops live on the bottom of the ocean floor and others bury themselves in the sand like clams. Some scallops are also capable of short distance movement by opening and closing the valves of its shell. 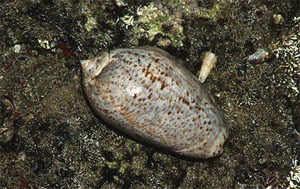 The swimming clam (Lima pacifica) is a clam that is capable of using its silica like extensions for swimming. They are found wherever there is enough water for them to be able to swim, breath and feed. Eight overlapping plates characterize this green-striped chiton (Chiton virgulatus). Chitons are herbivores that move along the surface of rocks using their radula to eat algae. Although they often move to feed chitons are not very active animals. This is the underside of a brittle star (Ophionereis annulata). In the center of its five arms is a central disk where the mouth is located. 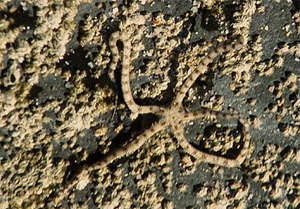 Brittle stars use their tube feet located on the bottom of the arms to feed. They are quick animals and they are found during the day hiding under basalt and coquina rocks. If an arm happens to get caught by a predator however, the brittle star can regenerate or re-grow that arm. Found in the many pools of water within the rocky intertidal zone are several species of shrimp. This snapping shrimp (Alpheus sp.) produces a sound that stuns its prey. 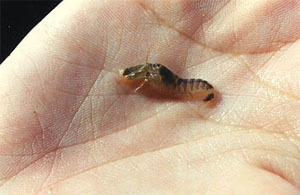 Many other shrimp found within the tidal pools are scavengers, which eat dead organic materials. Shrimp have good eyesight and their front arms, legs and antennae are able to sense movement in the water. The lumpy claw crab (Eriphia squamata) uses its front claws to break open the shells of snails so it can eat what is inside. Lumpy claw crabs are highly mobile and are found in all four zones. 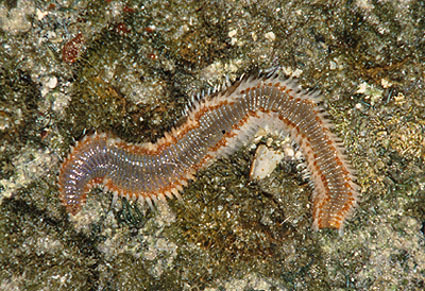 The fire worm (Eurythoa complanata) is commonly found under basalt boulders in zone three. It is a segmented worm with each segment having a pair of bristles. 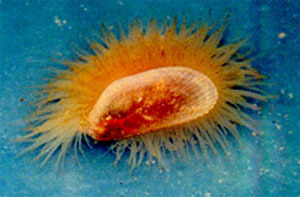 The bristles are used in locomotion. When threatened the sharp bristles (containing glass-like material) located all over its body fall off. These bristles can become imbedded in the skin and cause pain. 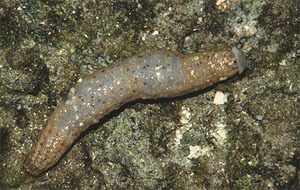 The sea cucumber (Holothuria) may look like a worm but it is not. Sea cucumbers are more closely related to brittle stars and sand dollars than they are worms. They can be found moving across both basalt and coquina in search of food and shelter. When threatened sea cucumbers are able to eviscerate spitting up all of their internal organs. This will not normally kill a sea cumber because like the arms of the brittle star sea cucumbers organs can regenerate. Many bony fish also inhabit the rocky intertidal zone. This tadpole clingfish (Gobiesox pinniger) is usually found clinging to the bottom of basalt boulders in zones two and three. The pelvic fins of the tadpole clingfish have been modified into suction cups that enable them to cling to hard surfaces. This helps the fish avoid getting knocked around by waves. 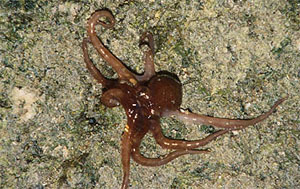 The octopus (Octopus fitchii) also has suckers that enable it to attach on to substrate. The suckers are located on the underside of each arm. They help the octopus grab a hold of things such as prey items and rocks. Usually octopuses are found under basalt and coquina rocks in zones three and four. Octopuses use their arms and siphons for locomotion. They have the ability to change color and when threatened they release ink to distract predators.